Big news! Kabuto Live is now out of Beta and ready for you to use to boost your revenue. Thanks to the help of the Kabuto Community and everyone who helped with testing, we were able to fix bugs and make some great UI improvements during the Beta period. Say goodbye to the days of having to integrate with other Remote Access tools to complete remote jobs, and hello to the simple “Kabuto Live” button available on all Kabuto Devices. Kabuto Live contains everything from Remote Access, to Remote Task Manager, to Remote Command and/or PowerShell Prompts and more. View various real-time hardware info from the System Information tab inside of Kabuto Live. Upload, view, and search for files on Devices remotely via the File System tab inside of Kabuto Live. Start a remote command or PowerShell prompt from the Terminal tab in Kabuto Live. Use the Remote Task Manager tab to start and kill processes, and see CPU & RAM usage. A major piece of feedback we received during Beta had to do with Unattended Access. 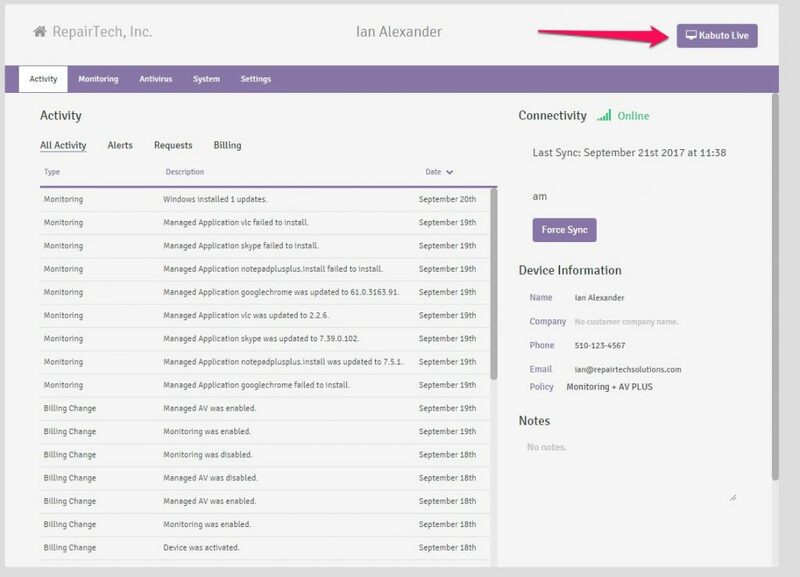 To address that, we implemented an update that allows techs to set a specific window of time to control a Client Device with Unattended Access. With this update, you can now request access for a specific time of your choosing. The first time you access a Device, the end user must approve it via a modal on their end, but after that, you will be able to access the Device unattended for the entire duration of time you requested. Log in to your Kabuto Online Dashboard, head over to any Kabuto Device, and click the “Kabuto Live” button in the upper right-hand corner. Follow the prompts from there to begin your 30-Day Free Trial and request access from the end user! We encourage you to watch our “Intro to Kabuto Live” walk-through video here. Check out our Documentation and FAQ page to answer any upfront questions you have. Email support@repairtechsolutions.com with any questions not answered on our FAQ page or Documentation. Kabuto Live is an optional paid upgrade priced at $19/month per technician for unlimited Devices. Each tech will receive a 30-Day Free Trial and can use it as much as he/she wants after enabling the upgrade. Improved connection speed and Remote Session performance by adding faster connection protocols. Adding file download functionality so you can download files from a client machine during a remote session. We hope you’re as excited about Kabuto Live as we are, and we look forward to hearing your feedback at support@repairtechsolutions.com.